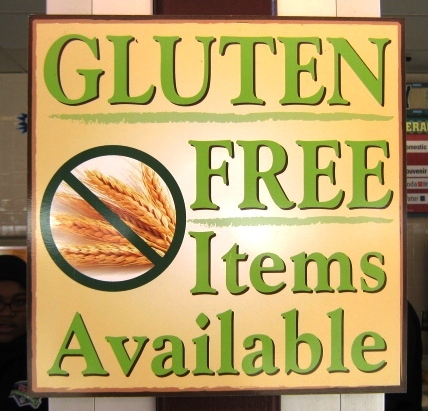 If you are the proud possessor of a gluten allergy, you might think it’s next to impossible to eat gluten-free at the ballpark. But fortunately, that is not the case anymore. The MENU is there. You have to look harder for the food. Because my wife is afflicted with celiac disease, it makes finding food at any recreational event somewhat difficult. Obviously the classic hot dog with the bun is out, as is pizza, soft pretzels (in most cases), pretty much most of the menu—and perhaps most sadly, beer, although that is a big money-saver. Fortunately, baseball teams are far more customer-oriented these days. Teams are not only expanding their menus in a big way, they are also going above and beyond to accommodate people with needs: peanut-free suites, vegetarian and kosher items, and yes, gluten-free selections. But that doesn’t mean you shouldn’t prepare for a day at the ballpark, so here’s a few things you should do before you go. It’s amazing how much stuff can be had without wheat. 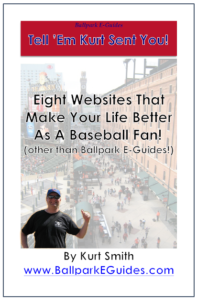 1) Gluten-Free at The Ballpark Tip #1: Visit the Team Website. 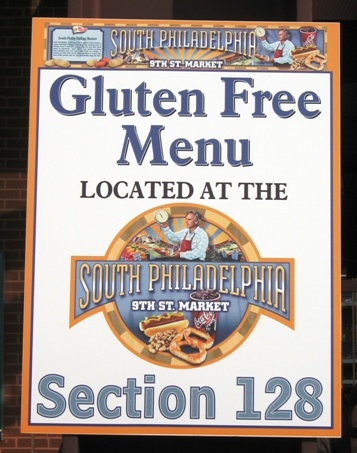 Many teams will tell you what foods are available at the ballpark for vegetarians and celiacs; some teams will even have a stand dedicated to serving gluten-free items only. The Red Sox, Phillies, Mets, Braves, Rays, Yankees and Nationals all have stand alone concession stands for celiacs, with things like dogs or BBQ sandwiches on gluten-free buns, gluten-free cupcakes or brownies, pizza sometimes, nuts and other snacks, and Redbridge or another brand of gluten-free beer. In the ballpark section of the website, there’s usually an Amenities Map. This will tell you the location and items sold at each concession stand; if they don’t have a stand for gluten-free items they might have some items at their regular concession kiosks. If you don’t see any of this information, it doesn’t hurt to e-mail the team and ask them what they can do for you. Usually they’ll get back to you with all the information you need; it’s highly probable they’ve heard the question before. From Turner Field. Wife was able to enjoy a ballpark dog. 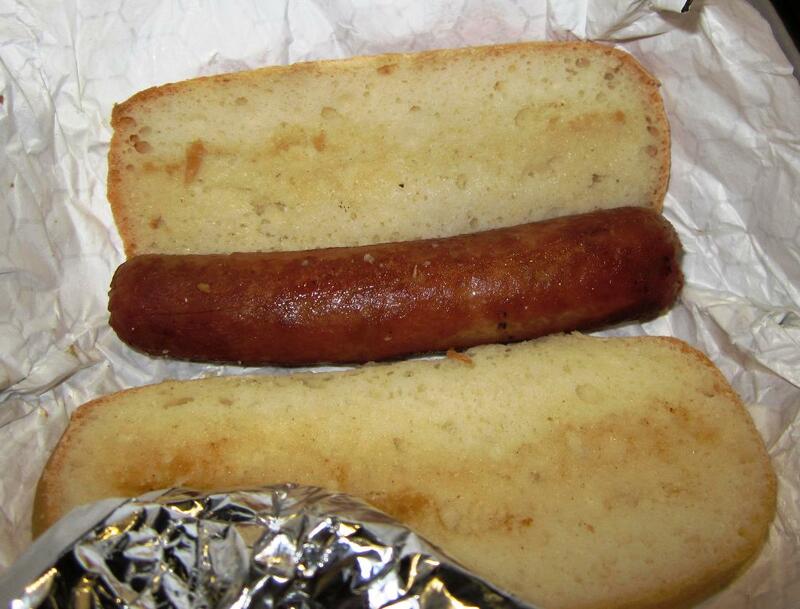 2) Gluten-Free at The Ballpark Tip #2: Bring Your Own. It’s not much of a secret anymore that you can bring your own food into the ballpark, so it’s no problem to bring a small bag of Cheetos, Rice Chex, peanuts or anything else your stomach will allow you to legally snack on. You can’t bring alcohol, but at most ballparks you can bring in sealed drinks. This is an especially nice thing at a place that doesn’t have a dedicated stand for celiacs; you can bring in your own hot dog roll and ask for that footlong dog without the bun. 3) Gluten-Free at The Ballpark Tip #3: Watch for Awareness Nights. I’m seeing this more and more these days—Celiac Disease Awareness Night at the ballpark. It usually just means they’ll tell you where the gluten-free food is, and you might get a discount on tickets. If you sign up for the team’s ticket alert newsletter, they’ll let you know when it’s coming. I know the Phillies and Mets do this, and I’m sure they’re not the only ones. 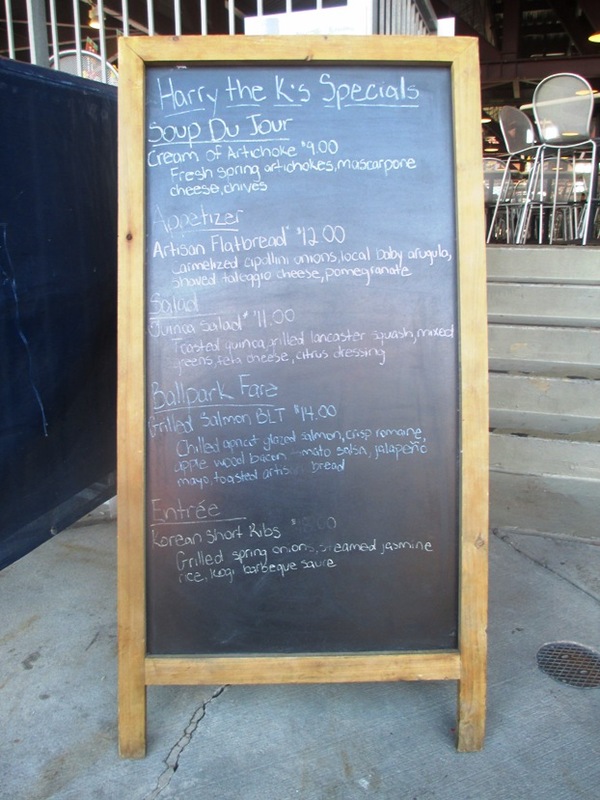 Didn’t have enough chalk for the gluten-free specials. 4) Gluten-Free at The Ballpark Tip #4: If All Else Fails… You can always try the ballpark restaurant for a meal before or after the game. Most all ballparks have a restaurant attached these days, and they’re often part of a chain that should have at least some experience in serving folks with allergies…Miller Park in Milwaukee has a TGI Friday’s, Yankee Stadium has a Hard Rock Café, and Comerica Park in Detroit has the Beer Hall and Corner Tap Room attached. Most times you can enter and exit the restaurant without having to leave the ballpark. The ballpark restaurant is much more likely to be able to accommodate your allergy needs, since they’re serving different kinds of food all day long. If you can’t go for a burger without the bun, there will probably be nachos, chili, chicken salads, and a selections of other things that should be safe. So there’s four tips that should make going gluten-free at the ballpark much easier on you, since it’s awful tough to enjoy the game without at least a hot dog. Teams are great about this these days, so the ballpark is at least one place where you shouldn’t have to worry about what to eat. Want to know more about ballpark food? Try reading this. Find out how to get the best live baseball experience at the best price…sign up today!